Hidden among the ruins of the Mortal Realms thrive the Flesh-eater Courts. Bound by the madness of their Abhorrant Ghoul Kings, throngs of mordants live out their pitiful lives feasting upon the corpses provided by the endless war and strife of kingdom after kingdom. In every corner of the realms, nightmarish tales are told of the Flesh-eater Courts, and when they take to the battlefield, they bring with them death and horror. These cards make managing your actions and spells on the tabletop even easier. 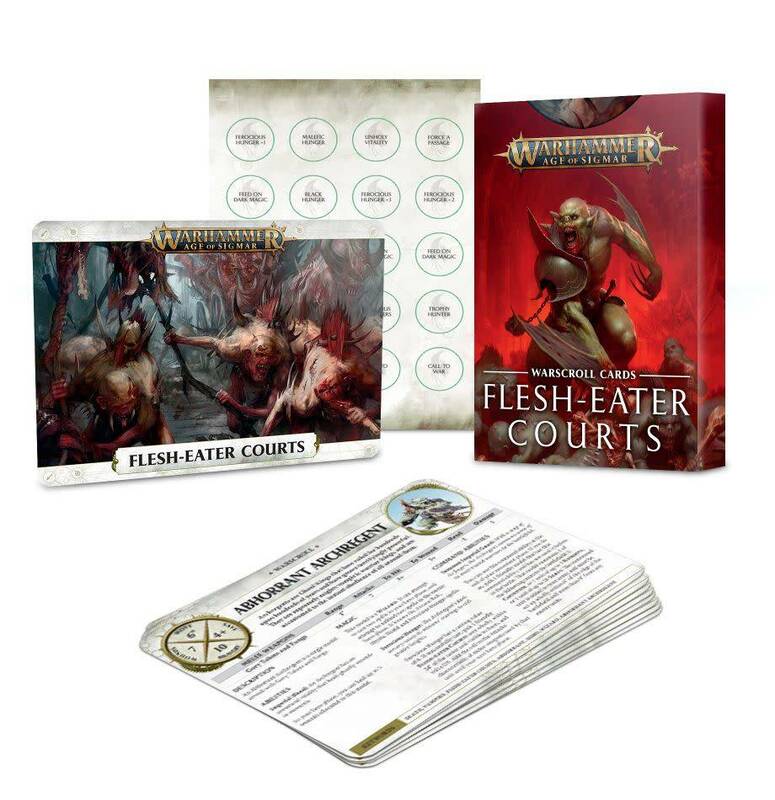 Decorated with haunting artwork and photography, they include all of the information you need for running each unit from Battletome: Flesh-eater Courts in your games, as well as their endless spells. There are also two sheets of double-sided push-out card gaming tokens to help you manage everything from command points to ability effects. This is a set of 17 warscroll cards, including 13 unit warscroll cards, 3 Flesh-eater Courts endless spell warscroll cards for use in games using the Malign Sorcery rules, and a warscroll card for the Charnel Throne scenery piece. The two sheets of push-out card gaming tokens include a huge variety of designs to help you track every aspect of your game. 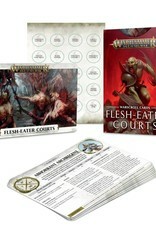 Please note, you'll need a copy of Battletome: Flesh-eater Courts to use the contents of this set.